Well, when you plan for traveling to any country, must inform your travel agent that you are traveling with an infant and he has responsibility of child safety moderation, as there are limitations about where it may be sited. Generally, the accommodate goes by the window so it doesn't obstruct other passenger's access any more. 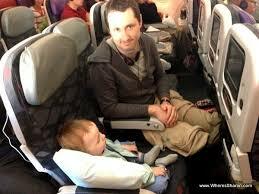 Sitting far forward is more suitable traveling if you are flying with your infant. Back sitting will be nuisances because it is less suitable for deplaning than the far forward seats of the plane, noisier, and vibrates more which can make your child irritating. You can have a good experience, or a bad one, on any airline. Mostly, it depends on how hassled the land and cabin squad are. Commonly, although travelers experience that the some of the airlines that have good repute generally is inclined to be the most child-friendly.